Brides, planners and professionals are picking up their place cards also called table cards or seating cards for upcoming weddings, conferences and events. Our clients love our digital calligraphy for place cards. We serve our local San Francisco and Embarcadero area clients as well as clients from surrounding cities and nationwide including Napa, Carmel, Southern California, New York, Boston, Atlanta and Seattle, Washington. Our clients are excited to pick up their personalized place cards with digital calligraphy also known as machine or computer calligraphy for their upcoming events. They are done within 2-3 days with professional results, elegant digital calligraphy and affordable prices. We enjoy meeting our clients or shipping their place cards to their destination. 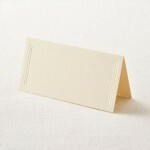 The above Font Style, Bickham is one of my favorite font styles for place cards and other stationery. The ink color used on this place card is brown and the card stock is ecru. For more font styles, pricing and Ordering Instructions please see our Calligraphy Page. I can personalize your place cards with elegant Digital Calligraphy in 2 days. 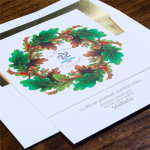 Simply pick out your favorite place card style from our place card category or mail me your favorite place cards to our Embarcadero Store, and email me your guest names. Prices for Place Card calligraphy is $1 for Black Ink and $1.25 for colored ink. Please call or email me with any questions. Don’t forget to see our Happy Customers on our Testimonials Page.